It’s not an iPhone. That is the instant reaction when you first handle an LG Viewty, a new touch-operated mobile which includes a high quality camera. If you have tried Apple’s device, you will notice that in common with almost every other mobile out there, LG has fallen short at the last mile of user interface development. It is easy to find fault with small details, like the awkward jog wheel positioned on the underside of the mobile, around the camera lens, or the fact that entering a carriage return into a memo is a five-key operation (Menu – Insert – Symbols – Carriage Return symbol – OK). I recommend spending an afternoon working methodically through the features, armed with the manual and the occasional hunt through internet forums like this one if you really want to know what the phone can do. Not that the manual is particularly good. I read it through, and was concerned to find no mention of Outlook synchronization. How would I get my contact list onto the phone? I need not have worried; the LG PC Suite immediately picked up my Outlook data and synchronized it to the device. Not being an iPhone has advantages. The Viewty is feature-packed, with an amazing 5.1 megapixel camera (the iPhone is 2 megapixels), Flash and Java, FM radio, and the ability to play DivX video. With the right combination of open source software, you can rip a DVD, copy it to the Viewty and watch it on the train. It is also much cheaper than an iPhone. Here in the UK, the iPhone will cost you £689, combining the cost of the hardware and the compulsory minimum contract, whereas you can buy an unlocked Viewty outright for £310, or operators will do the usual range of enticing contract deals. A point of interest to me as a developer is that the Viewty has a Flash-based UI, like other recent LG mobiles. Want to write an app or a game? In principle, Flash is a possibility as well as Java. Adobe’s runtime stamps its character all over the UI, with lots of little graphical effects such as gradients and shadows. It is also generally speaking a chunky display, which is good for touch control and visual clarity (especially if your eyesight is poor), but limits the amount of detail on view without scrolling. The Viewty is a touch-driven phone, which means no numeric keypad, just a 3″, 240 x 400 pixel screen with three hardware keys at the foot, several side controls, and the aforementioned jog wheel. There are also two lenses, a main lens on the underside and a small front lens for video calls. Accessories comprise headset with remote volume control, USB cable, and a stylus, but no memory card. Omitting the memory card is silly as you are bound to need one; some of the features are little use without it. The memory card is the microSD type. These are available in sizes up to 8GB, but compatibility with the larger sizes is doubtful. That is, up to 2GB works perfectly. Above 2GB seems to work somewhat, but must be formatted outside the device, and does not work with the camera. The implication is that the hardware support is there, but needs a software update. Stick with 2GB for the moment. There is also a screen protector (a plastic film) which you are meant to apply yourself. You will not enjoy this. It is hard to avoid trapping air bubbles or specks of dust under the protector. On the other hand, if you do not use the protector, the screen itself is bound to suffer scratches. Apply it and live with the odd bubble or speck. The main lens is unprotected, though slightly recessed. This seems odd. You will probably want a case; the choice is limited at the moment and some users have improvised. The Viewty is not always intuitive, but after a few days I have found it easy to use. The soft keys vibrate slightly when pressed, which helps the usability; they feel that bit more like real buttons. When you start the phone, you will see four soft keys at the foot of the screen. The first, you will learn, is Menu, offering access to all the features. The second opens a virtual keypad; the third is for messaging, and the fourth the address book. In addition, if you stroke the screen just above these soft keys, a shortcut menu appears, filling the whole screen. I am not sure why this does not show anyway, by default, because it is useful. Somewhat useful anyway – I have not yet figured out why Games & Apps on the shortcut menu is empty, but on the full menu contains Space commando. One of those quirky things you have to get used to. What about entering text? This is important to me, as I use a phone as much for email and note-taking as for calls. I prefer a miniature QWERTY keyboard, but the Viewty is not bad at all. You have several options. Keypad is standard, slow texting using a numeric keyboard. T9 input is also available. Keyboard is my favourite, a QWERTY keyboard in landscape view, though it does pretty much require two hands. You can also have handwriting recognition, either in a box or over the entire screen. I did a quick test versus the hardware keyboard on my Samsung i600. I am quicker on the Samsung, but only by about 25%. I prefer text input on the Viewty to what I remember of the iPhone when I tried it. This is the trade-off inherent in a touch phone. You get a much bigger screen, but suffer a little when it comes to character input. On the Viewty, it is worth it, especially when you consider its camera and video capabilities. Do you need the stylus? This, I fear, is another symptom of LG’s slightly slapdash approach to UI design. The stylus comes in a smart case with a strap. You can therefore attach the stylus to the device, if you can live with a dangling black object that looks like a lipstick holder. I could not, therefore I removed it. Unattached, the stylus is easy to lose, therefore it is likely to stay in your desk (or get lost). It is a shame, since certain operations, such as pan and zoom in the web browser, are tricky without it. LG should have eliminated both the stylus and the need for it. Personally I dislike mobile phones that need a stylus. They are fiddly at the best of times. Fortunately, you can just about get by without it on the Viewty. You can get to the camera from the menu, but it is easier to activate it by turning the device on its side and pressing what looks like the shutter. In a moment, the Viewty becomes a camera, either for still images, or by using a hardware selector switch, a video camera. I found the camera controls took some getting used to. One secret is that you have to tap the screen to open the camera controls. These let you zoom the image, switch flash and close-up on or off, set the image size, and access more advanced features like ISO speed, white balance, contrast and colour tone. Two great features of the camera are Panorama, for stitching together several images into a wide view, and Continuous, for taking 9 shots in quick succession. Continuous is ideal for action shots. You will rarely manage to click the shutter just when the striker kicks the ball towards the goal, especially given the lag, but a continuous shot might capture the moment. How is the quality? It’s a great deal better than most mobiles. Here’s one user’s example. I also like the camera’s ease of use, zoom aside. To take a picture, point at your subject and press the shutter lightly. The auto-focus kicks in, until a box around your subject turns green. Press the shutter fully and you’re done. Is it good enough that you no longer need to take a dedicated camera? That’s the key question; after all, if you have a camera with you, why bother spending money on fancy camera features in a phone? There is no definitive answer; it depends what you intend to do with the pictures. Although the Viewty is not a serious replacement for a standalone camera, it pushes out the “good enough” boundary a little further. I’ve not done any comparison with other camera-oriented phones like the N95 or even the iPhone, though these guys have. If you want a phone primarily for its camera, you should try out the competition as well. I also dock the Viewty several points for its lack of lens protection. The video camera is a treat. OK, it is just a bit of fun, but for a souvenir of some memorable occasion it is great. Features are again impressive, including image size and quality, white balance, colour tone, contrast, and choice between 30 or 120 fps, though 120 fps videos play back in slow motion. The Viewty has remarkable on-board editing facilities. You can cut, fade, merge, add effects, add voice-over or other audio soundtrack, and change the speed. What’s the point? Well, one possibility is creating instant videos for upload to You Tube or similar. I understand that the Viewty is meant to have a built-in in You Tube upload feature, but it is missing from the UK models. Strange. You can obtain a cable for TV out, but this is an extra. The Viewty plays a variety of formats, including MP3, WMA and AAC. The headset plugs into a standard mini-jack adaptor, which means you can also use your favourite headphones. The remote volume control is a neat touch. Quality seemed good to me, though the audio player has only basic features. Transferring files to your Viewty is quirky. You can use the LG PC Suite (provided you run Windows), but file transfer is slow. Alternatively, you go into Phone settings and set USB connection mode to Mass Storage. Now you can copy your MP3s at high speed, which is great, but curiously the Viewty seems incapable of reading the metadata and sorting the files into albums within the built-in library, even if you use separate folders. This looks like a glitch that LG could sort in an update, if it wishes. DivX playback is a great feature, though getting hold of DivX files in the most suitable format can be a challenge. LG supply a DivX converter on the Viewty CD, but it is lacking the MPEG-2 converter that you most likely want, and invites you to purchase it as soon as you try to run it. There is also the problem that most commercial DVDs are encrypted and you might not be entitled to rip them, even though software to do so is easily available. Finally, video converters have a bewildering array of options and formats and you need some expertise to know what to choose. If you successfully navigate these obstacles, you can have a lot of fun playing videos on your Viewty. Viewty has a web browser, but it’s not much fun to use. Some users have installed Opera Mini and report that it is better. There is also an email client that supports POP3 and IMAP, a voice recorder which works pretty well, an organizer, calculator, world clock, currency converter and so on. The FM radio works provided you have a strong signal and use the headset as an aerial. It is easy to use custom images and sounds for wallpaper and ringtones. The LG PC Suite is half-baked. The launcher has “setup” in its name, so always asks for admin rights on Vista. This may be deliberate, as the content browser only works for me if it has admin rights. It includes a multimedia player (why?) which insists that I do not have a sound card, but seems to work anyway. I can forgive it, because Outlook sync does seem to work OK and this is the critical thing from my point of view. That said, when I tried it just now sync failed and I had to reboot the phone to fix it. It may be something to do with switching between Mass Storage and Data Service modes; all a bit ugly. It’s not an iPhone. That’s no bad thing; but LG could learn from Apple’s attention to detail, especially when it comes to those final usability touches. I also wish the Viewty supported wi-fi. That’s partly because of the high cost of data services here in the UK. Wi-fi is also handy on a home or office network; I use it a lot on the Samsung i600. Nevertheless, this is an impressive phone. It will appeal to geeks who enjoy fiddling with DivX converters as well as casual users who will like its good looks and excellent camera. More generally, the LG is proof that a Flash-based UI has real merit. Most other mobile UIs (not that one) look somewhat clunky in comparison. I think this will catch on in a big way. There must be lots of reviews which end like this; nevertheless it is worth saying. 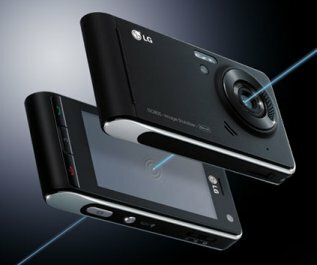 If LG could fix a few niggling issues, like doing away with the stylus, putting the jog wheel on the side, chucking an 8GB memory card in the box, and adding a lens cover, the Viewty would be magnificent. As it is, it is only very good. Postscript: sadly LG has spoilt the Viewty’s reputation by failing to release any firmware updates to fix the inevitable flaws and problems that users have discovered. More comment here. I have had my LG Viewty about 7 months and at first was very happy. I noticed that dust gets into the innards of the set from my pocket. The dust has started to obscure the screen a little. I sent the phone back to Mobiles2yourdoor requesting an explanation and repair. They have refused to accept any liability for this deficiency and have asked for £100 to repair (for dust accumulation?) it. I have turned it down as I dont want to pay £100 every 7 or 8 months to have it cleaned or whatever.However, they have demanded a £23.50 fee just to return the mobile. I am writing off both mobiles2yourdoor and LG (who mobiles2yourdoor blamed for the refusal to repair under warranty). Orange dont want to know either. Looks like O2 and an Iphone are the next bet. I had an argument with Samsung over the same issue. It seems to be a controversial subject. I argued that the seal was faulty and that large amounts of dust should not get under the screen in normal use. It was fixed under warranty in the end; but I have no idea whether you could achieve the same. I’ve just getting an LG Viewty, i have installed the LG suit to my PC, when i look in images..i can’t find m pictures i have taken myself..just pictures i have bluetoothed. I don’t have a memory card yet..does any1 know where they could be? I am planning to get an LG viewty, and was/is pretty excited about it. But after reading this whole page, including the links, i don’t really know if i should continue to get it. So the question is, should i still get it? Bought this phone, wasn’t particularly happy with it. My previous phone of four years was a touch screen (nokia) with video and camera and naturally this one had a way better camera and video camera feature. Hand written recognition not so good and when the touch screen all of a sudden stopped working I lost all faith in ever buying another LG phone again period. 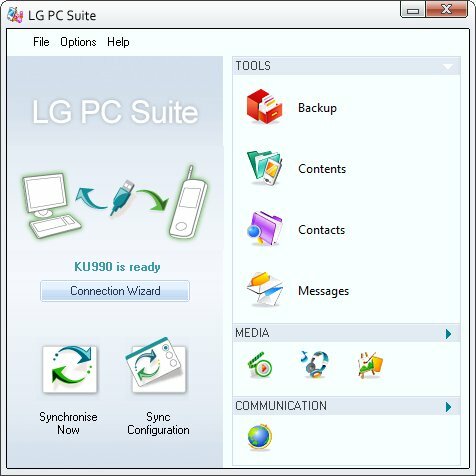 does anyone know where or what website you can get the LG pc suite KU990 software . Ok, I have had sooo many problems with this phone. Seriously, do not waste your time with it. yes, it looks nice, yes it has a good camera but it does not live up to what LG promised. The first problem I had was that the speaker went on the phone, so i couldn’t hear phone calls. The next problem I had was that the phone keeps freezing. Then i would have to take out the battery just to get it started again. The next and absolutley worst problem I had was that now it keeps cutting off, literally just turning itself off. How annoying when your in the middle of a phonecall or text message? Seriously, this phone is not worth the hassle. I cannot wait for my contract to run out so I can be rid of this montrosity of a phone.